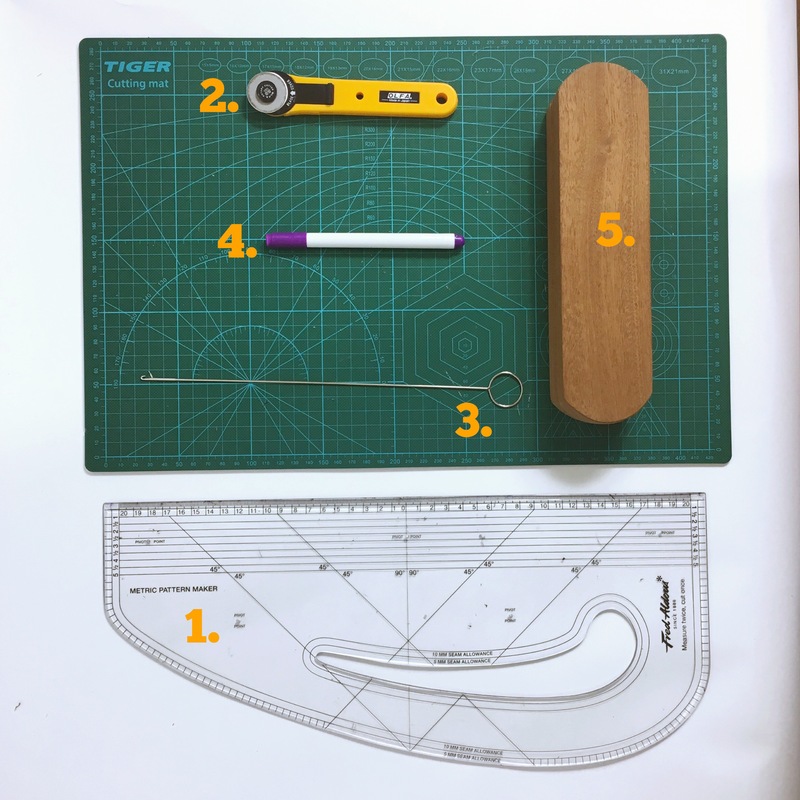 Today I’m bringing you the next of my Top 5 lists – sewing tools! This was inspired by the Essentials post from Rachel of House of Pinheiro‘s #sewphotohop challenge on Instagram. I love a good gadget and I tend to buy a lot of sewing related paraphernalia that I often don’t end up using! Some, however, make the cut and become indispensable. I’ve included in this list, tools that I use regularly and have found I can’t live without. I guess this is more of a drafting tool rather than a sewing tool but since I love drafting and hacking patterns this is an invaluable tool in my collection. It makes it easier to draw curves, straight and perpendicular lines as well as a quick way to add on seam allowances. I only recently got into using a rotary cutter and I’m really enjoying it! I have a fabulous pair of extra sharp tailor shears but they are super duper heavy and long and using a rotary cutter makes a nice change! I like the rotary for cutting smaller pieces (which can fit on an A1 cutting mat or the A3 mat pictured) and to achieve really precise neat lines. It’s great for slippery fabrics which are hard to pin too! Turning out rouleau loops is one of the most satisfying things! It took me a while to get the hang of using this little gadget but now I can’t get enough of it! I love little straps on tops and dresses so again it’s a really useful tool for me! If you’re having trouble using your turner, check out this tutorial here from Tilly and the Buttons. Do you get days when your chalk marker just won’t show up on your fabric? It seems to happen to me quite a lot so this little pen is really useful. I like using it to mark on darts and buttonholes, knowing it’ll just wash off later. You can make much more precise marks with a pen like this than with chalk! Everyone has a tailor’s ham and seam roll but do you have a clapper? It’s basically just a wooden slab but it’s essential to get those really sharp seams or for help pressing difficult fabrics! I learnt about how useful these are from Closet Case online jeans workshop. They use them to press from heavy denim seams to get them to lie really flat and it worked a treat! Now I pretty much use it all the time and it really helps to create crisp seams and darts. I noticed you selected the 28mm rotary cutter! Just recently I’ve discovered the joys of using this smaller size – I have the 60mm & the 45mm but this 28 is a dream to use! Another thing I love is my 6″X24″ clear quilting ruler – I use this to line up my grainlines all the time. I have a 45mm cutter as well and I hardly use it. The smaller blades are so much easier to use especially for little pattern pieces! I actually have an unopened quilting ruler somewhere. I really need to fish it out and use it! Ooo! I might need a pattern master to add to my collection since I also do a lot of pattern hacking. Thanks for sharing! Definitely get a pattern master if you’re doing a lot of hacking. I love it for that! Thanks for another great post! I need a clapper now, where did you get yours? I got mine from eBay!